2) Enter your School ID, check the box “Pick students from a list”, enter your School Password, and select the “Student” icon. 3) On the “Class Selection” page, resize the browser window so that you’re able to see the desktop. When you can see the computer desktop, click on the small icon ahead of the web address in the browser address bar, hold down the mouse button, and drag the icon onto the desktop. You should now have a desktop icon that students can use for easy access to Essential Skills. You can also bookmark the “Class Selection” page if your students are familiar with how to access the browser bookmarks. Here are some simple steps for bookmarking a site. 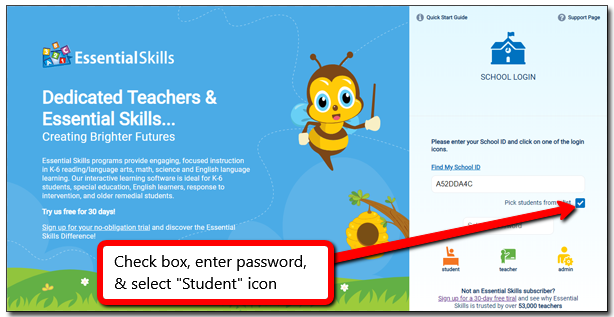 Student passwords can be easily updated in the Teacher Dashboard. 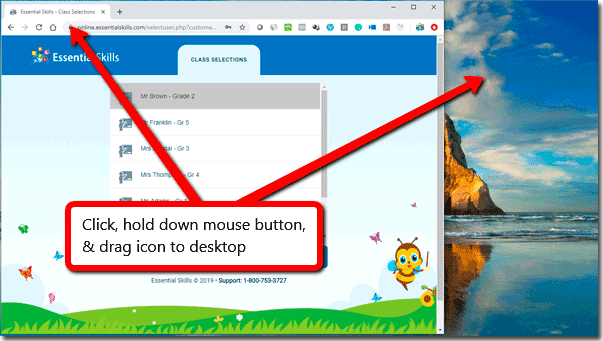 Simply click the “Students” button in the Teacher Dashboard, then “Edit Students”, update the student password(s) in the password field, and click “Save All Changes”. You can hit “enter” to quickly move down to the next field. Though not recommended, it is possible to save the student password field blank, allowing students to login without having to enter a password. Although Essential Skills is compatible with all desktop browsers, it is recommended that you run Essential Skills in Google Chrome. You can download Google Chrome for free here. Thank you for choosing Essential Skills! Please do not hesitate to contact us should you have any questions – we’re here to help!